Have you ever baked something and it came out completely wrong and had to redo it over again? The other day I got up early to bake my friend a lemon cake for his birthday, and I left it in the oven a tad too long and it came out a giant cookie…yup, and hard as a rock! Not so great as a birthday cake! Good thing Betty Crocker was there to save the day 😉 But how frustrating. 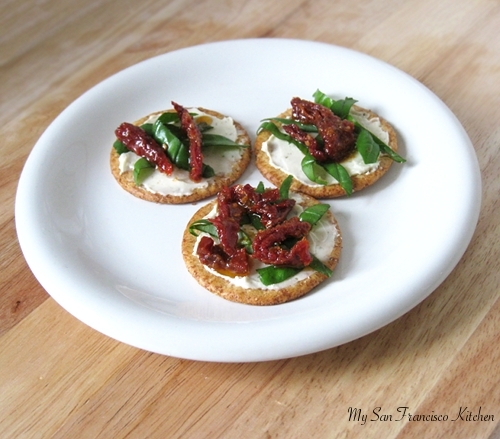 At least these sun-dried tomato and basil crackers are pretty hard to mess up! All you need is your favorite cheese spread (just plain cream cheese works great!) with sun-dried tomatoes in a little olive oil and basil & you have a pretty appetizer tray. I LOVE sun-dried tomatoes, so I am always looking for new ways to eat them. In a small bowl, mix sun-dried tomatoes with olive oil and salt and pepper to taste (if they do not already come in seasoned oil). Wash and slice basil leaves in 3 pieces each. Spread 1 tsp cheese spread over each cracker, and top with basil and tomatoes. This entry was posted in Appetizers, Snack, Vegetarian and tagged basil, cheese, crackers, cream cheese, sundried tomatoes, tomatoes. I love easy, quick recipes like this! 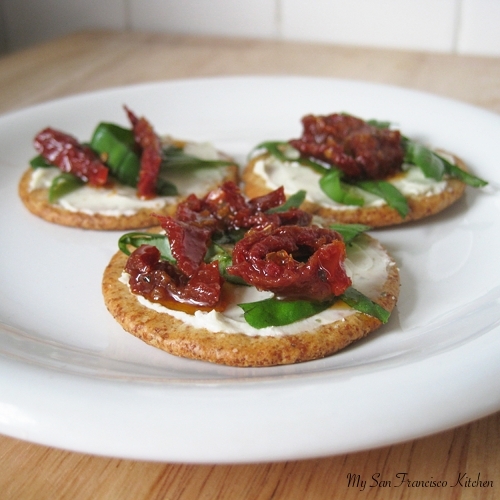 Sun-dried tomatoes have such great flavor, and paired with basil both ingredients shine. Good stuff – thanks. These are such cute little crackers. I love sun dried tomatoes and together with basil, yum! !